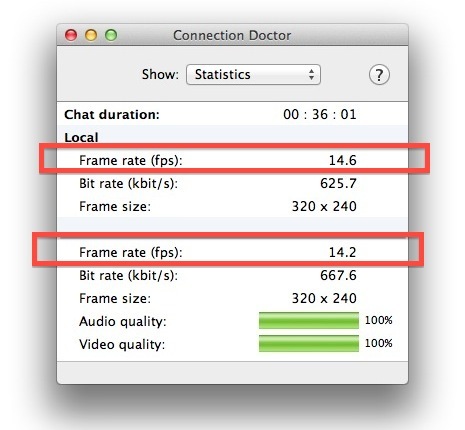 If you’re recording video chat or just troubleshooting problems with iChat, knowing the frame rate and other video statistics can be helpful information. From the Video menu, pull down to “Connection Doctor”, then select the “Statistics” option from the pull-down menu to see the window shown up top. The group under “Local” is your own Mac, and below will be the screen name and statistics of the Mac you are video chatting with. Frame rate typically hovers around 15 FPS on a high speed connection for both parties, which is slightly lower than what is usually seen in Facetime video calls on the same internet connections.